You probably saw this coming. 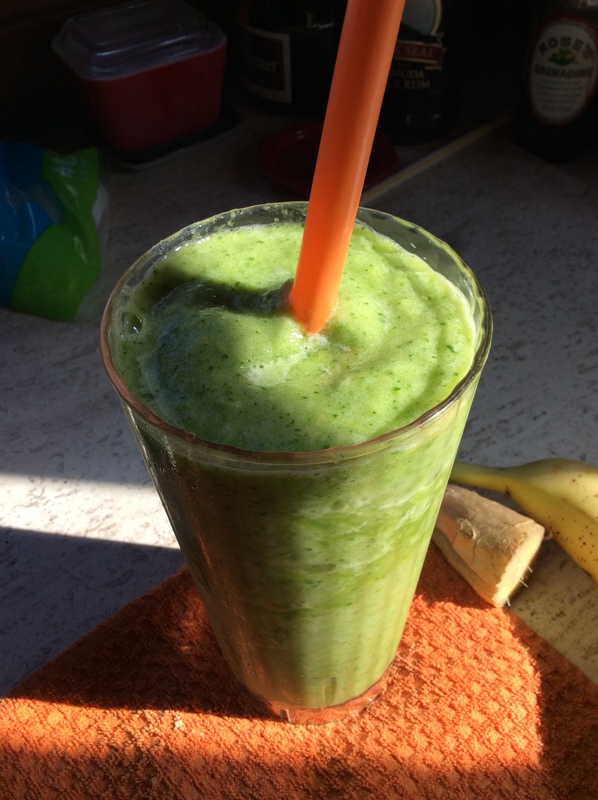 If you read Gut Check while I was in Florida, you know I became increasingly obsessed with a gingery green smoothie sold at the juice bar chain, Tropical Smoothie Cafe. You probably figured I couldn’t let it go when I returned to Ohio. Today I have two happy announcements: I found a Tropical Smoothie Cafe in Cleveland (locations.tropicalsmoothiecafe.com) and one in the works for Canton. And we can now make Detox Island Green Smoothies at home. At the restaurants, the 24-ounce green smoothie has just 180 calories and is a blend of mango, banana, pineapple, kale and spinach with a hit of fresh ginger. Tony saw a worker scoop a portion of frozen green stuff into a blender when making my smoothie one day. That led me to believe the spinach and kale were not tossed fresh into the blender. They were pureed together in advance and frozen. At home I pureed fresh spinach and kale leaves with a bit of water in a food processor and froze it in an ice cube tray, making sure each cube held 2 tablespoons. Then I cut the mango and pineapple into one-inch cubes and froze one-cup portions in Baggies. I also froze an entire sliced banana. See? The ingredients themselves would serve as the ice in the smoothie. The smoothies I had in Florida were creamy but not milky, with a smooth, milkshake-like consistency. I knew that meant the frozen ingredients were very finely pureed. I probably needed a Vitamix to do the job properly, but I would have to make do with my ordinary blender. I consulted USDA calorie tables to help figure out the proportions of the recipe. If the calories in the original were just 180, I knew I couldn’t use a cup of mango and a cup of pineapple, which alone would push it over the calorie limit. I settled on one-half cup mango, one-half cup pineapple and one medium-size frozen banana. I buzzed the fruit in my food processor with three quarter-size slices of ginger and one-half cup water until fairly smooth. Then I transferred the lumpy-smooth mixture to the blender, added two frozen cubes of the greens and another one-half cup water, and blended until smooth. I arrived at this processor-blender technique after much trial and error, finally realizing my cheap Hamilton Beach blender couldn’t handle the entire operation itself. If you own a heavy-duty blender, you can skip the processor and just dump everything in the blender. The second smoothie I made went together much more easily, although I still had a medium-size mess on my hands — a processor bowl, blender, ice cube tray and rubber spatula to wash. To me, it was worth it. I recommend preparing and freezing ingredients for multiple smoothies so you won’t have to start from square one when a craving hits. In my case, that will be daily. In the bowl of a food processor, combine the frozen mango, pineapple, banana and ginger. Pulse while pouring one-half cup of the water through the feed tube. Continue to process until the fruit begins to break down is about half chunky, half smooth. Transfer fruit mixture to a blender. Add spinach-kale cubes and remaining one-half cup water. Pulse and then blend until very smooth. Makes 1 smoothie. Note: To make spinach-kale cubes, combine 1 cup firmly packed fresh spinach leaves and 1 cup firmly packed fresh kale leaves (minus tough stems and ribs) in a food processor with 2 tablespoons water. Process until leaves are chopped very fine, adding more water if needed to produce a dense pesto-like mixture. Measure 2-tablespoon portions into an ice cube tray and freeze. This will make about 4 cubes. Repeat with more kale and spinach for a larger batch. In my rant on food expiration dates a couple of weeks ago, I left out two categories of food that stump many people. First, have you ever wondered how to tell when pickled and brined foods should be tossed? I have, and several years ago I tried to find out. After many calls, I finally located a food scientist who had the answer. Pickled and brined foods last a long time but not forever, he said. Cloudiness in the pickling or brining liquid is an indication that it’s time to dump the stuff in the garbage and buy a new jar. “Whether your canned goods are over the hill or not depends in part on how they were treated. Canned foods that have been frozen or exposed to temperatures over 100 degrees deteriorate more rapidly than those stored at room temperature. “Also, high-acid foods can react with the metal can and affect the taste, texture and nutritional value of the foods, according to the U.S. Department of Agriculture’s Food Safety and Inspection Service. “Generally, if the cans have been stored properly, low-acid foods — such as canned meat and poultry, stews, potatoes, corn, carrots, spinach, beans, beets, peas, pumpkin, pasta and vegetable soups except tomato — will keep for two to five years. High-acid foods — such as tomato and citrus juice, apple products, mixed fruit, peaches, pears, plums, pickles and sauerkraut — should be discarded after 12 to 18 months. Steamed stone crab claws; chicken salad with grapes, almonds and dried apricots; corned beef and cabbage. What I ate in/from restaurants, etc. Cuban sandwich, iced Cuban coffee at Mervis’ in Fort Pierce, Fla.; lentil soup and salad at the Orange Box Cafe in Frostproof, Fla.; pot roast, fried apples and a corn muffin at Cracker Barrel in Valdosta, Ga. (it was walking distance from our motel, a consideration when pulling a camper); a rubbery cheese omelet, ham lunch meat, yogurt and coffee at the Quality Inn in Valdosta; an egg and cheese bagel and three plain doughnut holes at a Dunkin’ Donuts in southern Kentucky; yogurt, a hard-cooked egg and coffee at a Red Roof Inn in London, Ky.; half of a meatball sub from Subway; miso soup, sunomono and a Fujiyama Roll (tempura shrimp, eel, cream cheese and salmon) and a glass of pinot Grigio at Sushi Katsu in Akron; fried fish, coleslaw and green beans at the Friday fish fry at St. Thomas Eastern Orthodox Church in Fairlawn; a spicy Thai salad with chicken and an apple at Panera Bread. Polenta is grits and aren’t you the same person who said to me several years ago, “Y’all can keep y’all’s grits?” ….I treat grits as pasta. Anything you would put on pasta, I would put on grits, especially roast beef and gravy (instead of potatoes). I ate a lot of polenta AND grits in Florida, as you read in my newsletter. I have always loved polenta, which is an entirely different animal than grits… yellow, creamier, with a backbone of chicken broth. Inexplicably, I began liking polenta’s anemic cousin, grits, about a year ago. I sprinkle them with Splenda. Mitch’s letter got me thinking about all the foods I once disdained but now enjoy. Do tastes change that much as we age? I am curious — are there foods you disliked most of your life but enjoy now? I have a raft of them, from grits to okra to licorice. What are yours?